Medical Circle Pro is Premium WordPress theme, is one of the powerful WordPress theme with highly crafted features. This theme is well suited for hospital, nursing home, general clinics, medical store, dental, pediatric , gynecology, veterinary clinics, pediatric and overall medical websites as well as personal portfolio sites for dentists, doctors, surgeons, gynecologist, general therapist and all medical sector people. 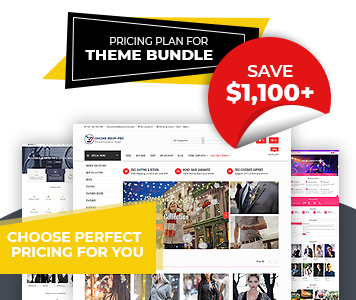 This theme comes with one click demo import, page builder by site origin compatible, video and text documentation and many more features. 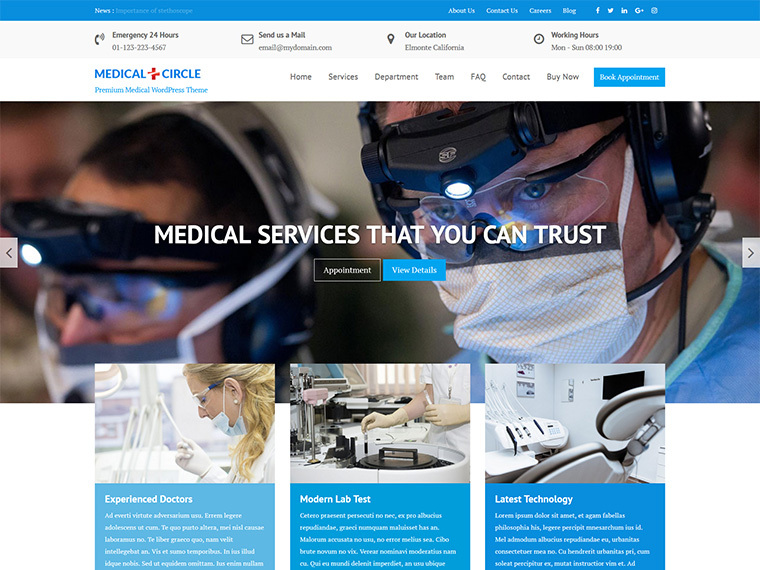 Medical Circle Pro is also well designed in a way that you can use this theme for variety of website like business, corporate, conference, charity, nonprofit, environmental, gym, parallax, political, one page, multi page, spa and shop etc. You can easily make best eCommerce shop with the help of this theme. In addition Medical Circle Pro comes with added custom widgets, customizer based theme options, home page and inner pages options, header options, footer options, blog options, sidebar options and many more. Moreover, image size options, slider options, featured col options, menu options, important message section, notice section, social sections etc. Unlimited number of slider and section items is the best part of this theme. Recently introduced repeater options on widgets and customizer will provide the best experience for you. This theme is really awesome due to cross browser compatible, responsive design, SEO friendly codes, child theme compatible and many more features available on theme. Try this high end features theme today and feel the best ever experience on WordPress themes. This theme comes with demo import facility. You can easily make the site as our demo with single click. No more burden. Suitable for hospital, nursing home, general clinics, medical store, dental, pediatric , gynecology, veterinary clinics etc. It can be use for various type of sites as well. You can use this theme for other types of site as well. This theme is one page and multipage ready, so use this theme on various type of sites including blog too. 9+ custom Widgets. This theme comes with advanced custom widgets for home page and sidebar management. Make your home page as your need with lots of options on widgets. Custom template is available to make the inner pages with the help of Page Builder by Site Origin Plugin. Use page builder plugin to make awesome site. Want to Sell product from you site or start new WooCommerce site. Just start using this theme. Make your medical store easily on medical estore. This theme is one page and multipage ready theme. You can make your site one page easily. You will get one page menu options on menus and widgets. You can easily make every section of your site with the help of page. Just select the available page on the widgets and customizer to make the whole site. A new era introduced on widgets and customizer. You can select the unlimited number of pages on Widgets to make the every section on sites. By the concept of repeater, you can use unlimited number of slider on your site. Just select the page, you will get all the slider easily. No restriction. No any restrictions for pages on every section made by widgets. Select the number of pages as you want on the site items. Isn\'t good? This theme have very beautiful features section with slider and site contents. You will have lots of features on the slider. You will have lots of slider options to manage the slider section including repeater field, slider text alignment, hide text on slider etc. You will have responsive image for slider as well as background image for slider. You can choose one of them which is suitable for you. AT About Widget help to show about section on home page easily. Change the column number as your need. No any restrictions for numbers. Advanced blog section will help to show the recent blog or specific category post on home page. Highly crafted section accordion is available on theme and it is suitable for home page and inner pages as well. Try this, it really awesome. You can use AT Contact Widget to make the contact section either in home page or inner pages. You need to use contact form 7 to make the contact form. Department section is very nice section on this theme. You can check the demo department section to know more about it. You can showcase all your achievements, portfolios and important moments via this section. This section is very nice for showcase. Header section includes address, notices, info and social bar on the top including one level menus and many features. Its marvelous. You can book the appointment for the doctor via that button of the header or you can just add the link there. Check it now, theme is free. Sidebar options with left, right, no sidebar, middle column, both sidebar on home page and inner pages including blog and archive pages. You can easily change the primary color and background color of site with single click. You have more colors for Featured col sections and footer section as well.